If you've ever been to the West Tisbury Farmers' Market, surely you know Thi Khen Tran... though you might know her as The Egg Roll Lady. Originally from Vietnam, she has made the Vineyard her home and sets up shop at the Farmers' Market every Wednesday and Friday with her egg rolls, cold rolls, bean curd, and various other Vietnamese delights. Our family always gets the "cold rolls" - soft, chewy rice paper wrappers filled with rice noodles, herbs, and tofu, and served with a peanut dipping sauce. These are cold, crunchy, and satisfying - the perfect summer afternoon treat! Bridgit and I headed across the street to the Farmers' Market this morning and bought a pair of cold rolls to snack on while we walked through the market. They were so good that I was inspired to try to recreate them myself. Don't be intimidated by working with Báng Tráng (the circular rice paper wrappers)... I have a few tricks that make them super easy to work with. It's a lot of fun to set up an assembly line and wrap these little packages up! The sky's the limit on fillings. These would be great for a picnic on the beach because they're so portable! 2. Place the dry noodles in a large bowl (I used half a package and it was plenty). When the water is hot, pour it over the noodles. 3. Cover the bowl with a plate and let it sit until the noodles are soft, about 10 minutes. 1. Put a small pot on medium heat with 1 teaspoon olive oil. 2. Use your hands to crumble the tofu into the pot. 3. Add the spices and 1/2 teaspoon salt. Stir until hot. 1. Heat more water in the kettle. When it's hot, pour the water into a wide bowl. 2. 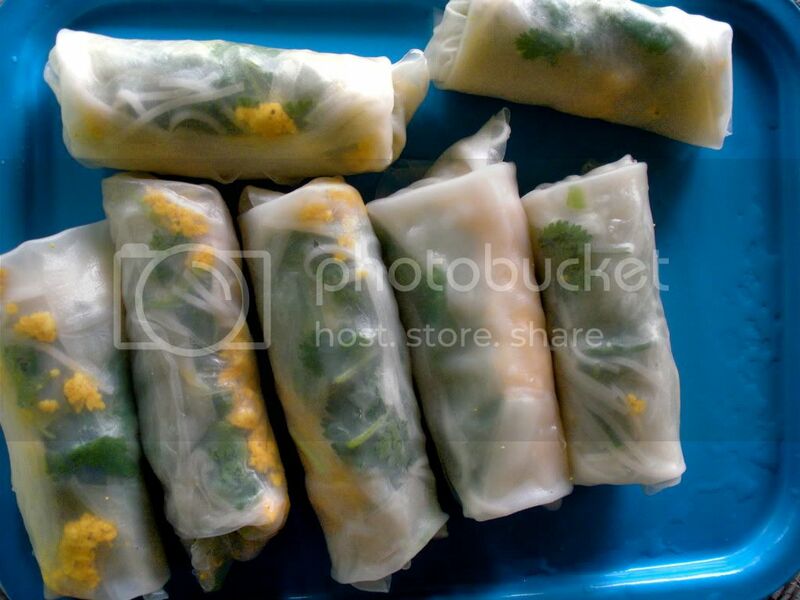 To hydrate the rice paper wrappers, dip them into the hot water for about 15 seconds, or until they're soft. * Trick: I doubled up my wrappers up so that they wouldn't rip when I rolled the Cold Rolls. Place two wrappers on top of each other and dip them into the hot water. 3. Place the softened wrappers on a plate. Place a small mound of cooked rice noodles about 1/3 of the way into the wrapper. Add a slice of avocado, a bit of tofu, a few springs of mint, scallion, and cilantro. After you've made your cold rolls, you want to keep the wrappers moist in the fridge. Wrap each cold roll in a piece of paper towel, then run it under water to wet the towel. Place all the rolls in a ziploc bag and store in the fridge. These are heaven...I still remember the first time I made Nick try one (well attempted to) for the first time - we brought them to Long Point for a picnic and the damn seagulls ate them right out from under us...those birds have good taste.